Club Penguin Cheats by Mimo777 Club Penguin Cheats by Mimo777: Club Penguin Game Day! on Mini Clip! Whoa! Check this out! 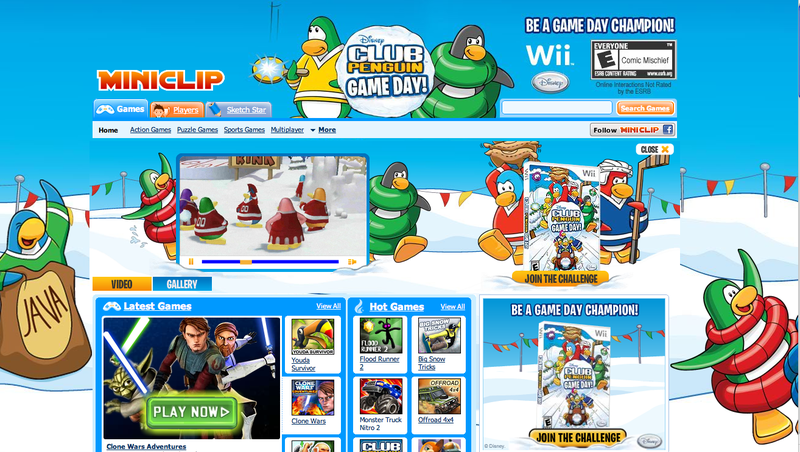 Me Santa was checkin' out some new games and came across this Club Penguin Game Day advertisement on Mini Clip! This is a HUGE ad, don't you think? It takes up most of the page! Let me know what you think about this ad, k? If you are not familiar with Mini Clip, it is a site similar to MimoGames.com. I are a CP nerd. yay cool a comment modding now! You should comment to help people not to be the best at modding. Yep, that's right! Club Penguin is really growing! Congrats to Stickers, Saavy, and Safa for making it to the mod list! Yeah, club penguin has gotten pretty big after going over to disney. It's a really fun game to play! I'm sure you'll love it once you get it. Like im modding yours? Good luck modding. Ya it looks very fun and i think its about $40.00 so save up or wait for your b-day! Dont try only this post, do other posts!I bet u have already though! Me either! My mom said I could get it for my b-day next month. Waddle on! I agree. Great detective work! Cool is just the word it sums up to my friend! lol, me too dude! Lets be CP nerds together! It shall all be one! Awesome is the other one word it all sums up to! Woot. It's always a pleasure to see new mods being added to the list. Good luck to all out there who wants to be a mod! Must have. I don't really know what Mini Clip is but I must find out! September 17th for Australia, and New Zealand. September 21st for North America, and Latin America. September 24th for the UK. Club Penguin has been a big company since 2006 or 2007 when Disney decided to partner up with Club Penguin. That's why Disney has made advertisements and games about Club Penguin.That's also why they have their video games and toys. Hope That Helped Your Answer. Awesome! Club Penguin is actually one of the fastest growing virtual worlds. Hope you get the game soon! cool im on you tube alot. ill keep my eye out! I had to go back to school today, so I'm not gonna be able to mod as much as I used to. I'll still try though. But luckily it's only a short term. Bout' 8 weeks. Hmmm, wonder if Billybob pays money to be advertised on other websites? Yeah, probably was put on today, otherwise Mimo would've posted bout' it already! You know how fast he is! 19th of September for Australia and New Zealand, and 22nd of September for Canada, US and UK. I'm pretty sure that's right. I know this is off subject but when is this weeks field-op coming out? This has to have just come on today cos i was playing on miniclip ast night! Good luck! I hope you get a chance to be a mod! Actually, that picture has been on Miniclip since September when the game came out! I saw it on a friend's laptop when he was on games in class! Love mini clip! It's awesome! But seriously, doesn't Club Penguin do ENOUGH advertising as it is? I would write more, but I have to go. Chaos out! I think September 26 or some date in September. Glad your enthusiastic! But you don't mod to just to say your a mod. You mod to help people. Glad your enthusiastic! But mod to help people, not just to say your a mod. I'm not surprised about this ad. It was always going to happen because miniclip advertises club penguin a lot. Since you didn't really answer a question, or correct someone, you shouldn't put CPG MOD next to your name. I can't wait to get the game aswell! Awesome! I never knew that the advertisement was on youtube aswell. Yeah! I love miniclip too! It's awesome! Club Penguin Game Day came out the 21st of september in US and came out the 24th september for UK. I think it came out september 19th for New Zealand and Australia. Hope I helped you! Congrats to Saavy, Safa153 and Stickers303 for getting on the mod list. Near can i ! Oh i cant wait ! Yeah lets throw them a party or something! Game Day is a Nintendo Wii game made by Club Penguin. I picked one up today at Sainsbury's (UK) and it is brilliant. You play games in either the Red, Green, Blue or YELLOW teams. Game day is a interactive game based of club penguin. You can earn coins on the game, and use wi-fi connection to send the coins you have earned to the ones on the computer based game! We should wait until all the mods are decided, then we should throw a party! I hate going back to school don't you? Club Penguin Game Day is club penguins new game where you can play as the red team, blue team, green team and yellow team. Your challenge is to conquer the island as your team in events. You can even earn stamps along the way! It's pretty awesome if I say so myself! Oops I ment to put september 17th for New Zealand and Australia. OMG that's cool! I didn't know Club Penguin would do that though because why would Club Penguin need a miniclip game if they have their own website? BTW, I think miniclip is one word, not two. When did Club Penguin Game Day come out? I think the exact date of CP game day is September 22 of this year. Hope everyone enjoyed Club Penguin game day! P.S Mimo I would lovee to be one of your CPG MODS!! Im use your website for everything! My name is Private 1998 on cp! I think only a party when the list is full. :D And all the mods begin with the letter S.
Also, all of those mods have been fans of Club Penguin Gang for a long time! well good luck with your term! I think club penguin wants more people to join since we've been losing more penguins. well of course. they even have club penguin has a top ten game! Club Penguin Game Day is a video game that's now in stores. they're just advertising it. It's actually a fun game.kinda like club penguin in expansion. I personally like it, the more the merrier! Am I right? Yes, i agree with you! I like it too! I'm not trying to be mean but please try to just help people while modding, not just being the first person to mod a question. Wow, Club Penguin goin' big! I have the game and beat it in like 10 minutes. yeah, that's right, 10 minutes. I'm not kidding!!!!!!!!! This game is still fun though. =) peace out.